Find simple ways that you can rewire your thinking in order to help resolve some of the destructive negative thinking we all face from time to time. One of the challenges of parenthood is raising an emotionally healthy child. Learn how you can help kids handle their feelings and deal with tantrums. January 16th, 2016. This interview with Caroline Dowd-Higgins gives insights on how you can communicate simply, lovingly and effectively. May 9th, 2015. This show focuses on how our attitudes and thinking patterns impact our ability to get a good night’s sleep. March 30th, 2015. 11 Ways to Live an Awesome Life. February 16th, 2015. Guest Jude Bijou describes some of the best, most loving gifts ever to give to your sweetheart on Valentine’s Day–or on any day of the year–and they won’t cost you a dime!. February 10th, 2015. Jude Bijou shares 8 free (yet priceless) gifts you can give your partner on Valentine’s day, or ANY DAY to make them feel loved. February 5th, 2015. Jude discusses the True Meaning of the Holidays with Tara Kennedy-Klein . December 23rd, 2014. Jude shares concrete action steps to help you deal with the often difficult, emotional triggers that come up in the holiday season. December 10th, 2014. Jude gives us nine tips on how you can find peace in your holiday season. November 29th, 2014. Felicia Gopaul, founder and president of the College Funding Resource (CFR) interviews Jude Bijou on developing her career as a successful psychotherapist. November 2nd, 2014. Kathryn Zox interviews award-winning psychotherapist Jude Bijou on handling kids and emotional control. 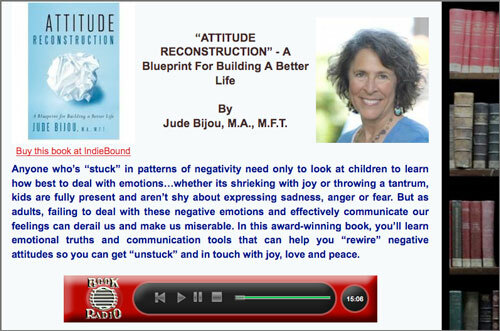 Jude talks with Sandy Fowler of Heart-Filled Holidays Radio about how to change your destructive thinking. A terrific interview about Attitude Reconstruction and finding peace in the kitchen with Tom Castrigno, is now on-line! T Love interview of January, 2014. T Love is a great interviewer and a great human being, coming from a stance of energy awareness. Listen to our interview. Dr. Walter Gaman, Dr. Mark Anderson and special guest author Jude Bijou. Dave Fuller and Jude talking about Attitude Reconstruction. October 7, 2013. Cathi Curen of Holistic Children Radio and Jude talk about children and emotions. September 21, 2013. Patricia Raskin speaks with Jude. Co-parenting on Father’s Day: How to cope with a holiday you no longer celebrate as a family. Jude talks with R. Winn Henderson, M.D., author or co-author of 38 books including “Freedom From Addiction”. Learn how to navigate your emotional roadblocks. Jude Bijou joins Jim Blasingame to reveal how our emotions can hold us back and how to take the steps to navigate around these professional and personal roadblocks. The Small Business Advocate – Are your affirmations working? Featuring Jude Bijou May 06, 2013 Are your affirmations working? Jude Bijou joins Jim Blasingame to talk about the power of telling yourself the truth about where you are, instead of using affirmations that sound good but aren’t true. A Woman’s Guide to Success and Jude discussing how to get out of a workplace rut on June 12, 2013. Jude chatting with Maureen Anderson on March 16, 2013 about Attitude Reconstruction. An interview with Shannon Sanford of Shannon’s Corner on April 23, 2013 about getting out of a rut. 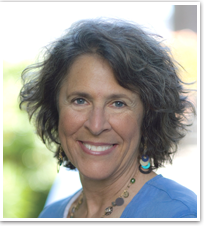 Jude has a great conversation about emotions, thoughts, and joy, love, and peace with tamara westwood of illuminations radio www.illuminationsSoulTherapy.com on April 26, 2013. Jude talking with Barb Adams of America Now Radio on March 23, 2013. Paul Worthington of DimaCast / The 6Sight Future of Imaging Report and PMA Newsline / Imaging Executive, March 20, 2013 on Procrastination. Relly Nadler interviews Jude about Attitude Reconstruction. February 20, 2013. Jude chats with Doug Caldwell about “How to get that “round-to-it” and stop procrastinating.” February 17, 2013. Mike Carruthers interviews Jude about procrastinating. Aired on 150 stations! February 21, 2013. Jude chatting with Sandy Fowler of Heart Filled Holidays on February 11, 2013 about what to do with critics and controllers who threatened your gatherings. 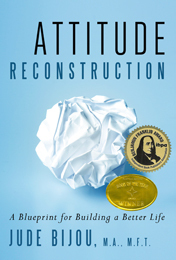 Jude chatting about Attitude Reconstruction with Wayne Hurlbert of Blog Business World – January 22, 2013. Jude talking Attitude Reconstruction with Tammi Baliszewski on Journey to Center Radio on December 20, 2012. Jude chatting with Mr. Dad, aka Armin Brott, about Attitude Reconstruction on December 31, 2012. Interview with Shannon Sanford of WTBQ serving lower New York area and Northern New Jersey, November 27, 2012. Lively Interview on Kari Moran’s Book Radio Show, November 15, 2012. Jude Talks on “Topical Currents” with Joseph Cooper and Bonnie at WLRN servicing Miami and South Florida on November 8, 2012. Part 1 of an interview with Cheryl for the “At Home Show,” National Radio Canada airing around Edmonton, Calgary, and surroundings, October 3, 2012. Part 2 of an interview with Cheryl for the “At Home Show,” National Radio Canada airing around Edmonton, Calgary, and surroundings, October 3, 2012. Interview with Caz Taylor and Ruben Garcia of Small Business Radio out of San Diego, CA – October 4, 2012. Jude chats with Michele Rosenthal of “Your life after Trauma” on September 19, 2012.